XAMonline has been a leader in test prep for over 22 years publishing study guides for 9 Advanced Placement exams every each year. XAMonline has the experience and knowledge to bring you the right study materials for your exam in a clear and concise way to enable you to be more efficient with your study time. The AP United States History exam is the most popular advanced placement exam with over a half million US students taking the exam each year. 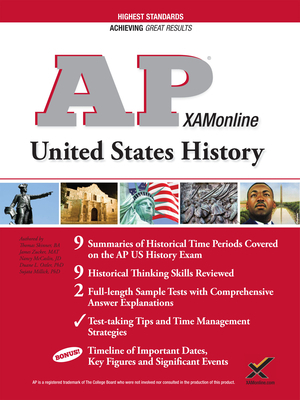 This Advanced Placement United States History covers all areas of the exam and includes 2 full sample tests with full explanations. Test questions were created by subject matter experts and former educators, who are familiar with the knowledge needed to successfully pass your AP U.S. History exams. The study guide is broken into 5 sections 1. About the Advanced Placement US History Examination 2. Historical Thinking Skills 3. Time Period Summaries 4. Sample Test One 5. Sample Test Two Focused Content - Study only the content on the test - All areas summarized including 9 periods from 1491 - Present. - Full preparation for short answer and source-based multiple-choice questions - Help navigating long essay questions and document-based questions (DBQs) - Expert Test-taking Strategies and Advice - Mr. James Zucker, AP Reader, has graded AP US History exams for 13 years and counting. He also is a consultant to the College Board for Advanced Placement exams. - Specific advice for optimizing your time during the exam - Understand what the graders are looking for in your essay responses.